A young boy befriends an orphaned bear and raises him from a cub. 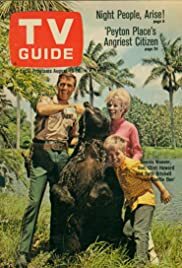 This fine family feature was the basis for the "Gentle Ben" television series. Based on Walt Morey's novel "Gentle Ben." Although Gentle Ben was made several years before I was born, I often used to watch this on BBC1 and BBC2 when they shown it around the late 1980's, often in the mornings during the school holidays. I found this series enjoyable. It was about a boy, Mark who had a pet brown bear which he named Ben. He lived with his mum and dad in Florida's Everglades and got up to all sorts of different adventures and often danger. Mark was played by Clint Howard and his parents were played by Dennis Weaver (Gunsmoke, Duel) and Beth Briknell. It would be nice to see some episodes of Gentle Ben again. Come on BBC, let's have some repeats of this instead of rubbish property programmes and makeover shows. Gentle Ben was produced by Ivan Tors, who also brought us Flipper and Sea Hunt.